A muscle is a group of muscle tissues which contract together to produce a force. A muscle consists of fibers of muscle cells surrounded by protective tissue, bundled together many more fibers, all surrounded in a thick protective tissue. A muscle uses ATP to contract and shorten, producing a force on the objects it is connected to. There are several types of muscle, which act on various parts of the body. A muscle consists of many muscle tissues bundled together and surrounded by epimysium, a tough connective tissue similar to cartilage. The epimysium surrounds bundles of nerve cells that run in long fibers, called fascicles. These fascicles are surrounded by their own protective layer, the perimysium. This layer allows nerves and blood to flow to the individual fibers. Each fiber is then wrapped in an endomysium, another protective layer. As seen in the image below, a muscle is arranged in a basic pattern of bundled fibers separated by protective layers. These layers and bundles allow different parts of a muscle to contract differently. The protective layer surrounding each bundle allows the different bundles to slide past one another as they contract. The epimysium connects to tendons, which attach to the periosteum connective tissue that surrounds bones. Being anchored to two bones allows movement of the skeleton when the muscle contracts. A different type of muscle surrounds many organs, and the epimysium connects to other connective tissues to produces forces on the organs, controlling everything from circulation to food processing. Whether it is the largest muscle in your body or the tiny muscle controlling the movement of your eye, every muscle functions in a similar manner. A signal is sent from the brain along a bundle of nerves. The electronic and chemical message is passed quickly from nerve cell to nerve cell and finally arrives at the motor end plate. This interface between the muscle and nerve cells releases a chemical signal, acetylcholine, which tells the muscle fiber to contract. This message is distributed to all the cells in the fiber connected to the nerve. This signal causes the myosin proteins to grab onto the actin filaments around them. These are the purple proteins in the image below. 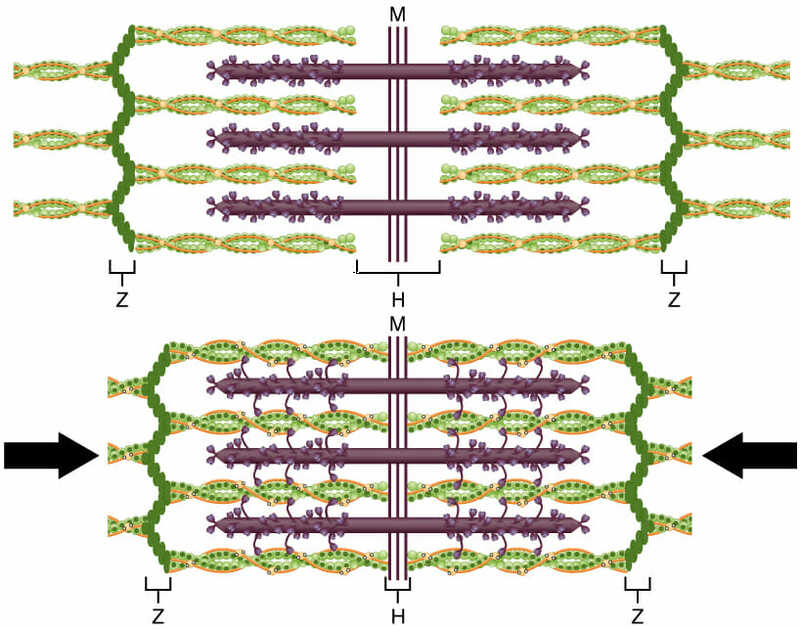 Myosin uses ATP as an energy source to crawl along the green filament, actin. As you can see, the many small heads of the myosin fibers crawling along the actin filaments effectively shortens the length of each muscle cell. The cells, which are connected end-to-end in a long fibers, contract at the same time and shorten the whole fiber. When a signal is sent to an entire muscle or group of muscles, the resulting contraction results in movement or force being applied. A muscle can be used in many different ways throughout the body. A certain muscle might contract rarely with a lot of force, whereas a different muscle will contract continually with minimal force. Animals have developed a plethora of uses for the forces a muscle can create. Muscles have evolved for flying, swimming, and running. They have also evolved to be pumps used in the circulatory and digestive systems. The heart is a specialized muscle, which is uses exclusively for pumping blood throughout the body. These different types of muscle will be discussed below. When you think of a muscle, most people generally think of a skeletal muscle. The biceps, triceps, and quadriceps are all common names for muscles that body builders tend to focus on. In fact, these general muscles are often composed of many small muscles that attach to different places to give a joint its full range of motion. 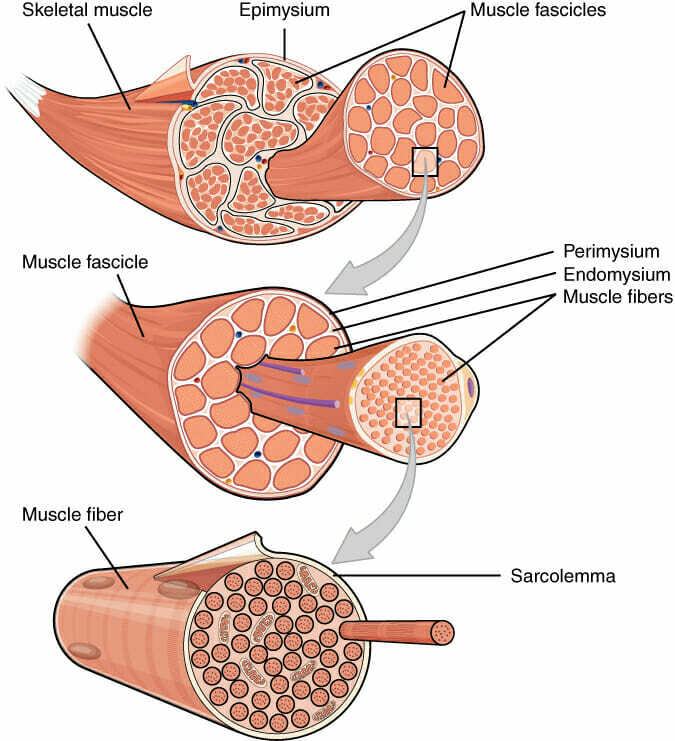 Skeletal muscle is a striated muscle. This means that each muscle fiber has striations, or linear marks, which can be seen when this muscle is put under a microscope. The striations correspond to the sarcomeres present in striated muscles, which are highly organized bundles of muscle cells which can contract quickly in concert. Skeletal muscle is controlled via the somatic nervous system, also known as the voluntary nervous system. Point your finger to the ceiling. This is your somatic nervous system in action, controlling your skeletal muscles. Cardiac muscle, while similar to skeletal muscle in some ways, is connected to the autonomous nervous system. This system controls vital organs such as the heart and lungs and allows us to not have to focus on pumping our heart each time it needs to beat. While there is a certain amount of conscience control we have over the autonomous nervous system, it will always kick in when we are unconscious. For instance, you can hold your breath if you like but you do not have to remember to breathe all the time. Cardiac muscle surround the chambers of the heart and is used to pump blood through the body. Cardiac muscle is similar to skeletal muscle in that it is striated. Unlike skeletal muscle, cardiac muscle fibers are arranged in a branching pattern instead of a linear pattern. Both skeletal muscle and cardiac muscle need to contract quickly and often, which is why the striations can be seen. Unlike skeletal and cardiac muscle, smooth muscle is not striated. This is because the individual muscle cells are not perfectly aligned into sarcomeres. Instead, they are displaced throughout the fibers. This gives smooth muscle the ability to contract for longer, although the contraction happens more slowly. Consider the muscle that contracts the sphincter on your bladder. This muscle may need to stay clamped shut for hours at a time and only gets a minute of relief when you go to the bathroom. Many other smooth muscles operate in the same manner. Like cardiac muscle, smooth muscle is mostly controlled by the autonomous nervous system. The many muscles that line your digestive tract work together to move food through the digestive system. Muscles attach to your hair follicles that all your hairs to stand up when it’s cold. Smooth muscle is almost everywhere in your body and aids in everything from circulation to digestion. 1. A big, strong bear goes in a cave to hibernate for winter. In the spring a skinny, weak bear emerges. What happened to the bear’s muscles? B is correct. Muscles that aren’t being used are wasted energy. The bear will use the protein and nutrients available in its muscle and fat cells to survive through the winter. Some muscles, like the diaphragm used to control breathing, will not see a loss in mass. Other muscles, like the leg muscles, are not needed during hibernation and will be allowed to atrophy, or decrease in size. 2. Growing muscles is known as hypertrophy. Body builders do this when they work out to increase the size of their muscle. Often, days after a good workout, the muscle that got worked will hurt slightly. What causes this? 3. Endurance runners are told to eat pasta the night before a big run. Why is this helpful? C is correct. The carbs found in pasta can easily be broken down into glucose, which muscle cells convert to ATP to store energy. This ATP is then used to activate the myosin heads and help them walk along the actin filament. In reality, any balanced meal will load your cells up with glucose and prepare you for exercise.